The Piper PA-28 Cherokee is a family of two- or four-seat light aircraft built by Piper Aircraft and designed for flight training, air taxi and personal use. The PA-28 family of aircraft comprises all-metal, unpressurized, single-engined, piston-powered airplanes with low-mounted wings and tricycle landing gear. They have a single door on the copilot side, which is entered by stepping on the wing. The first PA-28 received its type certificate from the Federal Aviation Administration in 1960 and the series remains in production to this day. Current models are the Warrior, Arrow and the Archer TX and LX. The Archer was discontinued in 2009, but with investment from new company ownership, the model was put back into production in 2010. The PA-28 series competes with the high-winged Cessna 172 and the similarly low-winged Grumman American AA-5 series and Beechcraft Musketeer designs. Piper has created variations within the Cherokee family by installing engines ranging from 140 to 300 hp (105–220 kW), offering turbocharging, retractable landing gear, constant-speed propeller and stretching the fuselage to accommodate six people. The Piper PA-32 (initially known as "Cherokee Six") is a larger, six-seat variant of the PA-28. The PA-32R Saratoga variant was in production until 2009. At the time of the Cherokee's introduction, Piper's primary single-engined, all-metal aircraft was the Piper PA-24 Comanche, a larger, faster aircraft with retractable landing gear and a constant-speed propeller. Karl Bergey, Fred Weick and John Thorp designed the Cherokee as a less expensive alternative to the Comanche, with lower manufacturing and parts costs to compete with the Cessna 172, although some later Cherokees also featured retractable gear and constant-speed propellers. The Cherokee and Comanche lines continued in parallel production, serving different market segments for over a decade, until Comanche production was ended in 1972, to be replaced by the Piper PA-32R family. 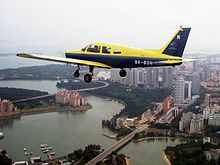 The PA-28-161 Warrior II flying in the livery of the Singapore Youth Flying Club – it is still widely used in basic flight training worldwide. Polly Vacher, a record-breaking UK pilot, in her PA-28-236 Dakota: The aircraft was built in 1994. In 1962, Piper added the Cherokee 180 (PA-28-180) powered by a 180-horsepower (134-kW) Lycoming O-360 engine. The extra power made it practical to fly with all four seats filled (depending on passenger weight and fuel loading) and the model remains popular on the used-airplane market. In 1968, the cockpit was modified to replace the "push-pull"-style engine throttle controls with quadrant levers. In addition, a third window was added to each side, giving the fuselage the more modern look seen in current production. Piper continued to expand the line rapidly. In 1963, the company introduced the even more powerful Cherokee 235 (PA-28-235), which competed favorably with the Cessna 182 Skylane for load-carrying capability. The Cherokee 235 featured a Lycoming O-540 engine derated to 235 horsepower (175 kW) and a longer wing which would eventually be used for the Cherokee Six. It included tip tanks of 17-gallon capacity each, bringing the total fuel capacity of the Cherokee 235 to 84 gallons. The aircraft had its fuselage stretched in 1973, giving much more leg room in the rear. The stabilator area was increased, as well. In 1973, the marketing name was changed from "235" to "Charger". In 1974, it was changed again to "Pathfinder". Production of the Pathfinder continued until 1977. No 1978 models were built. In 1979, the aircraft was given the Piper tapered wing and the name was changed again, this time to Dakota. In 1964, the company filled in the bottom end of the line with the Cherokee 140 (PA-28-140), which was designed for training and initially shipped with only two seats. The PA-28-140 engine was slightly modified shortly after its introduction to produce 150 horsepower (112 kW), but kept the -140 name. In 1967, Piper introduced the PA-28R-180 Cherokee Arrow. This aircraft featured a constant-speed propeller and retractable landing gear and was powered by a 180-horsepower (134-kW) Lycoming IO-360-B1E engine. A 200-hp (149-kW) version powered by a Lycoming IO-360-C1C was offered as an option beginning in 1969 and designated the PA-28R-200; the 180-hp model was dropped after 1971. At the time the Arrow was introduced, Piper removed the Cherokee 150 and Cherokee 160 from production. The Arrow II came out in 1972, featuring a five-inch fuselage stretch to increase legroom for the rear-seat passengers. In 1977, Piper introduced the Arrow III (PA-28R-201), which featured a semitapered wing and longer stabilator, a design feature that had previously been introduced successfully on the PA-28-181 and provided better low-speed handling. It also featured larger fuel tanks, increasing capacity from 50 to 77 gallons. The first turbocharged model, the PA-28R-201T, was also offered in 1977, powered by a six-cylinder Continental TSIO-360-F engine equipped with a Rajay turbocharger. A three-bladed propeller was optional. In 1979, the Arrow was restyled again as the PA-28RT-201 Arrow IV, featuring a "T" tail that resembled the other aircraft in the Piper line at the time. In 1971, Piper released a Cherokee 140 variant called the Cherokee Cruiser 2+2. Although the plane kept the 140 designation, it was, in fact, a 150-hp plane and was shipped mainly as a four-seat version. In 1973, the Cherokee 180 was named the Cherokee Challenger and had its fuselage lengthened slightly and its wings widened and the Cherokee 235 was named the Charger with similar airframe modifications. In 1974, Piper changed the marketing names of some of the Cherokee models again, renaming the Cruiser 2+2 (140) simply the Cruiser, the Challenger to the Archer (model PA-28-181) and the Charger (235) to Pathfinder. Piper reintroduced the Cherokee 150 in 1974, renaming it the Cherokee Warrior (PA-28-151) and giving it the Archer's stretched body and a new, semitapered wing. In 1977, Piper stopped producing the Cruiser (140) and Pathfinder (235), but introduced a new 235-hp (175-kW) plane, the Dakota (PA-28-236), based on the Cherokee 235, Charger and Pathfinder models, but with the new semitapered wing. The PA-28-201T Turbo Dakota followed the introduction of the PA-28-236 Dakota in 1979. The airframe was essentially the same as a fixed-gear Arrow III and was powered by a turbocharged Continental TSIO-360-FB engine producing 200 hp (149 kW). The aircraft did not sell well and production ended in 1980. In 1978, Piper upgraded the Warrior to 160 hp (119 kW) PA-28-161, changing its name to Cherokee Warrior II. This aircraft had slightly improved aerodynamic wheel fairings. Later models of the Warrior II, manufactured after July 1982, incorporated a gross weight increase to 2,440 pounds, giving a useful load over 900 pounds. This same aircraft, now available with a glass cockpit, was available as the Warrior III and was marketed as a training aircraft. PA-28s were built under license in Brazil as the Embraer EMB-711A and EMB-711C Corisco (PA-28R-200), EMB-711B (PA-28R-201), EMB-711T (PA-28RT-201) and EMB-711ST Corisco Turbo (PA-28RT-201T) and the EMB-712 Tupi (PA-28-181). Argentinian production was carried out by Chincul SACAIFI of San Juan, Argentina. Chincul S. A. built 960 airplanes between 1972 and 1995, including the Cherokee Archer, Dakota, Arrow and Turbo Arrow. The PA-28-236 Dakota was also assembled under license by the Maintenance Wing of the Chilean Air Force (which later became known as ENAER). By September 1982, 20 Dakotas had been assembled in Chile. The original Piper Aircraft company declared bankruptcy in 1991. In 1995, the New Piper Aircraft company was created. It was renamed Piper Aircraft once again in 2006. The company originally produced one variant, the 180-horsepower (134 kW) Archer LX (PA-28-181), and began testing two diesel versions, with 135 and 155 hp. Originally, all Cherokees had a constant-chord, rectangular planform wing, popularly called the "Hershey Bar" wing because of its resemblance to the convex, rectangular chocolate bar. Beginning with the Warrior in 1974, Piper switched to a semitapered wing with the NACA 652-415 profile and a 2-foot-longer (0.61 m) wingspan. The constant chord is maintained from the root to mid-wing, at which point a tapered section sweeping backwards on the leading edge continues until the tip. Both Cherokee wing variants have an angled wing root; i.e., the wing leading edge is swept forward as it nears the fuselage body, rather than meeting the body at a perpendicular angle. Aviation journalist Peter Garrison is also in the Hershey-bar wing camp, claiming that the semitapered shape has a neutral effect on drag: "to prevent tip stall, designers have resorted to providing the outboard portions of tapered wings with more cambered airfoil sections, drooped or enlarged leading edges, fixed or automatic leading edge slots or slats and most commonly, wing twist or "washout". The trouble with these fixes is that they all increase the drag, cancelling whatever benefit the tapered wing was supposed to deliver in the first place." For the Cherokee family, Piper used their traditional flight-control configuration. The horizontal tail is a stabilator with an antiservo tab (sometimes termed an antibalance tab). The antiservo tab moves in the same direction of the stabilator movement, making pitch control "heavier" as the stabilator moves out of the trimmed position. Flaps can extend up to 40° and 25° flaps are normally used for a short- or soft-field takeoff. The ailerons, flaps, stabilator and stabilator trim are all controlled using cables and pulleys. In the cockpit, all Cherokees use control yokes rather than sticks, together with rudder pedals. The pilot operates the flaps manually using a Johnson bar located between the front seats: for zero degrees, the lever is flat against the floor and is pulled up to select the detent positions of 10, 25, and 40°. Older Cherokees use an overhead crank for stabilator trim (correctly called an antiservo tab), while later ones use a trim wheel on the floor between the front seats, immediately behind the flap bar. All Cherokees have a brake lever under the pilot side of the instrument panel. Differential toe brakes on the rudder pedals were an optional add-on for earlier Cherokees and became standard with later models. Cherokees normally include a rudder trim knob, which actually controls a set of springs acting on the rudder pedals rather than an external trim tab on the rudder—in other words, the surface is trimmed by control tension rather than aerodynamically. 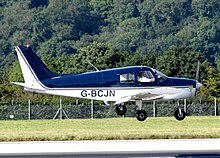 Piper PA-28-140 Cherokee Cruiser of the Bristol and Wessex Aeroplane Club lands at Bristol Airport, England (2016). Built 1974. Two-place, fixed landing gear landplane, Lycoming O-320-E2A or O-320-E3D engine of 150 hp (112 kW), gross weight 1,950 lb (885 kg). First certified on 14 February 1964. Approved as a 2,150 lb (975 kg) gross weight four place aircraft on 17 June 1965. Four-place, fixed landing gear landplane, Lycoming O-320-A2B or O-320-E2A engine of 150 hp (112 kW), gross weight 2,150 lb (975 kg). First certified on 2 June 1961. Four-place, fixed landing gear landplane, Lycoming O-320-E3D engine of 150 hp (112 kW), gross weight 2,325 lb (1,055 kg). First certified on 9 August 1973. Changes from the PA-28-150 include a tapered wing. Four-place, fixed landing gear landplane, Lycoming O-320-B2B or O-320-D2A engine of 160 hp (119 kW), gross weight 2,200 lb (998 kg). First certified on 31 October 1960. Four-place, fixed landing gear landplane, Lycoming O-320-D3G or O-320-D2A engine of 160 hp (119 kW), gross weight 2,325 lb (1,055 kg). First certified on 2 November 1976. Changes from the PA-28-160 include a tapered wing. Certified on 1 July 1982 for gross weight of 2,440 lb (1,107 kg). Four-place, fixed landing gear landplane, Lycoming O-320-D3G engine of 160 hp (119 kW), gross weight 2,440 lb (1,107 kg). First certified on 1 July 1994. Four-place, fixed landing gear landplane, Lycoming O-360-A3A or O-360-A4A engine of 180 hp (134 kW), gross weight 2,400 lb (1,089 kg). First certified on 3 August 1962. Four-place, fixed landing gear landplane, Lycoming O-360-A4A or O-360-A4M engine of 180 hp (134 kW), gross weight 2,450 lb (1,111 kg). First certified on 22 May 1972. Changes from the PA-28-180 Cherokee include a five inch fuselage extension, wing span increase, larger horizontal tail, gross weight increase and other minor changes. Four-place, fixed landing gear landplane, Lycoming O-360-A4M or O-360-A4A engine of 180 hp (134 kW), gross weight 2,550 lb (1,157 kg). First certified on 8 July 1975. Changes from the PA-28-180 include a tapered wing. Four-place, fixed landing gear landplane, Lycoming O-360-A4M engine of 180 hp (134 kW), gross weight 2,550 lb (1,157 kg). First certified on 30 August 1994. Four-place, fixed landing gear landplane, turbocharged Continental TSIO-360-FB, engine of 200 hp (149 kW), gross weight 2,900 lb (1,315 kg). First certified on 14 December 1978. Four-place, fixed landing gear landplane, Lycoming O-540-B2B5, O-540-B1B5, or O-540-B4B5 engine of 235 hp (175 kW), gross weight 2,900 lb (1,315 kg). First certified on 15 July 1963. Four-place, fixed landing gear landplane, Lycoming O-540-B4B5 engine of 235 hp (175 kW), gross weight 3,000 lb (1,361 kg). First certified on 9 June 1972. Changes from the 1963 certified PA-28-235 Cherokee Pathfinder include a five inch fuselage extension, wing span increase, larger horizontal tail, gross weight increase and other minor changes. Four-place, fixed landing gear landplane, Lycoming O-540-J3A5D engine of 235 hp (175 kW), gross weight 3,000 lb (1,361 kg). First certified on 1 June 1978. Changes from the 1972 certified PA-28-235 Cherokee Pathfinder include tapered wing. Four-place, fixed landing gear seaplane, Lycoming O-320-D2A engine of 160 hp (119 kW), gross weight 2,140 lb (971 kg). First certified on 25 February 1963. Four-place, fixed landing gear seaplane, Lycoming O-360-A3A or O-360-A4A engine of 180 hp (134 kW), gross weight 2,222 lb (1,008 kg). First certified on 10 May 1963. Four-place, retractable landing gear landplane, Lycoming IO-360-B1E engine of 180 hp (134 kW), gross weight 2,500 lb (1,134 kg). First certified on 8 June 1967. Four-place, retractable landing gear landplane, Lycoming IO-360-C1C engine of 200 hp (149 kW), gross weight 2,600 lb (1,179 kg). First certified on 16 January 1969. Four-place, retractable landing gear landplane, Lycoming IO-360-C1C or C1C6 engine of 200 hp (149 kW), gross weight 2,650 lb (1,202 kg). First certified on 2 December 1971. Changes from the 1969 certified PA-28R-200 Arrow include a five inch fuselage extension, wing span increase, larger horizontal tail, gross weight increase and other minor changes. Four-place, retractable landing gear landplane, Lycoming IO-360-C1C6 engine of 200 hp (149 kW), gross weight 2,750 lb (1,247 kg). First certified on 2 November 1976. Four-place, retractable landing gear landplane, turbocharged Continental TSIO-360-F or TSIO-360-FB engine of 200 hp (149 kW), gross weight 2,900 lb (1,315 kg). First certified on 2 November 1976. Four-place, retractable landing gear landplane, Lycoming IO-360-C1C6 engine of 200 hp (149 kW), gross weight 2,750 lb (1,247 kg). First certified on 13 November 1978. Features a T tail. Four-place, retractable landing gear landplane, turbocharged Continental TSIO-360-FB engine of 200 hp (149 kW), gross weight 2,900 lb (1,315 kg). First certified on 13 November 1978. Features a T tail. Two-place, fixed landing gear landplane, Lycoming O-320-D2A or -D3G engine of 160 hp (119 kW), gross weight 2,325 lb (1,055 kg). Replaced the PA-38 Tomahawk trainer in the late 1980s. Features the older Cherokee "2 side window" fuselage with the later tapered wing. Four-place, fix landing gear landplane, turbocharged Continental CD-155 diesel engine of 155 hp (116 kW). Introduced at AERO Friedrichshafen in April 2014. The compression-ignition engine is simpler to operate, avoiding starting difficulties, carburetor icing or propeller and mixture controls, and the liquid cooling does not suffer shock cooling in a rapid descent. The turbocharger maintains full power up to over 10,000 ft (3,000 m) to climbs at 700 to 500 ft/min (3.6 to 2.5 m/s) at 86 kn (159 km/h), and cruise fuel flow is 4.2 to 6.3 US gal (16 to 24 l; 3.5 to 5.2 imp gal)/h at 50 to 75% power and a 100 to 117 kn (185 to 217 km/h) IAS. The engine must be replaced every 2,100 hours. New versions introduced in 2019 intended as low cost VFR and IFR trainers respectively, for the flight training market. Two-place, with option for three-place, fixed landing gear, 180 hp Continental Prime IO-370-D3A, Garmin G3X Touch Certified avionics. IFR version includes GFC500 autopilot. Features the older Cherokee "2 side window" fuselage with the later tapered wing. The Cherokee series has been popular with private owners and flying clubs, with over 32,000 delivered. September 9, 1969, Allegheny Airlines Flight 853, a Douglas DC-9-31, collided with a Piper PA-28R-180 Cruiser over Fairland, Indiana, killing all aboard both planes. August 28, 1972, Prince William of Gloucester, was killed along with the copilot of his Piper Cherokee Arrow after crashing shortly after takeoff from Halfpenny Green in Staffordshire, England, in an air race. August 31, 1986, Aeroméxico Flight 498, a Douglas DC-9-32, collided with a Piper PA-28-181 Archer, owned by William Kramer, over Cerritos, California, killing all 67 people aboard both planes and 15 people on the ground. 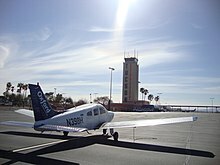 It was the worst air disaster in the history of Los Angeles, and resulted in regulatory changes requiring all airliners to be equipped with a traffic collision avoidance system (TCAS) and all light aircraft operating in terminal control areas to be equipped with a mode C transponder. November 17, 2011, a PA-28-180 crash four miles south of Perryville, Arkansas, claimed the life of Oklahoma State University head women's basketball coach Kurt Budke and assistant coach Miranda Serna, along with the pilot and another passenger. ^ Taylor, John W. R. (1961). Jane's All The World's Aircraft 1961–62. London: Sampson Low, Marston & Company, Ltd. p. 305. ^ Fred George (May 2017). "2017 Business Airplanes Purchase Planning Handbook" (PDF). Business & Commercial Aviation. Penton. p. 83. ^ Twombly, Mark R. (n.d.). "Training Aircraft Review: The Piper Warrior III". Archived from the original on 2008-01-29. Retrieved 2008-02-06. ^ New Piper Aircraft (n.d.). "Welcome to the Arrow". Archived from the original on 2007-12-13. Retrieved 2008-02-06. ^ a b New Piper Aircraft (n.d.). "Welcome to the Archer LX". Archived from the original on 27 January 2010. Retrieved 25 February 2011. ^ Piper Aircraft (2009). "Discontinued Aircraft". Archived from the original on 2009-06-21. Retrieved 2009-06-03. ^ Niles, Russ (July 2009). "Piper Likes Future With Imprimis". Retrieved 2009-07-29. ^ Piper Aircraft (2011). "Archer TX". Archived from the original on 13 July 2011. Retrieved 7 June 2011. ^ Collins, Richard L. (May 2005). "Flying Four By Fours". Retrieved 2008-02-06. 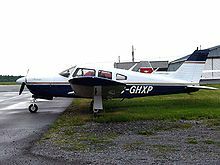 ^ New Piper Aircraft (n.d.). "Welcome to the Saratoga II TC". Archived from the original on 2008-05-09. Retrieved 2008-02-06. ^ "Karl Bergey, Chairman & CEO". September 25, 2007. Archived from the original on 2007-07-09. Retrieved 2007-09-25. ^ Gilbert, James (February 1968). "Pilot Report:The Cherokee D". Flying. 82 (2): 44–48. ^ a b c Twombly, Mark: "Piper Arrow," AOPA Pilot, June 1986. ^ a b c d e Airliners.net (n.d.). "The Piper PA-28 Cherokee Series". Retrieved 2008-02-06. ^ a b c d e f g h i j k l m n o p q r s t u v w x y z Federal Aviation Administration (January 2009). "TYPE CERTIFICATE DATA SHEET NO. 2A13 Revision 49" (PDF). Retrieved 2010-02-24. ^ Piper Aircraft (2009). "Warrior III Price and Equipment (plus PDF specs)". Archived from the original on 2009-04-26. Retrieved 2009-06-01. ^ a b Taylor, John W.R. Jane's All The World's Aircraft 1982–83. London: Jane's Yearbooks, 1982. ISBN 0-7106-0748-2. pp. 31, 438. ^ "Piper.com main page". Retrieved 5 May 2011. ^ "Piper Arrow". Retrieved 15 Feb 2017. ^ "Piper Archer". Retrieved 15 Feb 2017. ^ "Piper Archer DX". Retrieved 15 Feb 2017. ^ "Piper Warrior". Retrieved 15 Feb 2017. ^ Fred Weick, quoted by Terry Lee Rogers in ``The Cherokee Tribe``, The Cherokee Pilot's Association (1991), p.11. ^ ``The Cherokee Tribe``, p.45. ^ a b Garrison, Peter (January 2003). "Rectangular Wings". Retrieved 2009-12-26. ^ "Piper "Cherokee"/"Cruiser"/"Cadet"/"Warrior"". Plane&Pilot Magazine. 30 November 1999. Retrieved 15 February 2017. ^ "Piper Cadet Information Manual" (PDF). Piper Aircraft Corporation. 9 September 1988. Retrieved 15 February 2017. ^ Bertorelli, Paul (24 April 2014). "Piper's Archer DX Diesel". Avweb. Retrieved 28 April 2014. ^ "Piper's Diesel Archer Receives FAA Validation". Retrieved 21 April 2015. ^ Matt Thurber (November 21, 2018). "Pilot Report: Piper Diesel Archer". AIN online. ^ O'Connor, Kate (2 April 2019). "Piper Introduces Pilot 100/100i Trainer". AVweb. Retrieved 4 April 2019. ^ Mark, Rob (April 2, 2019). "Piper Introduces Pilot 100 and Pilot 100i Trainers". Flying Magazine. Retrieved 2019-04-04. ^ "Argentine Coast Guard". Retrieved 2013-08-07. ^ "Colombia Navy". Retrieved 2013-08-05. ^ "Qatar" (PDF). Archived from the original (PDF) on 2012-03-11. Retrieved 2013-03-08. ^ "Aviation Safety Network: Allegheny Airlines Flight 853". Aviation-safety.net. 1969-09-09. Retrieved 2013-03-08. ^ "1972: Prince William killed in plane crash". BBC News. 1963-08-28. Retrieved 2013-03-08. ^ "Prince William dies in air crash". Expressandstar.com. Retrieved 2013-03-08. ^ "Aviation Safety Network: Aeromexico Flight 498". Aviation-safety.net. 1986-08-31. Retrieved 2013-03-08. ^ "Austin American Statesman Coverage of Plane Crash". Statesman.com. 2010-02-18. Archived from the original on 2013-06-27. Retrieved 2013-03-08. ^ Haisten, Bill and Kelly Hines (18 November 2011). "OSU's Kurt Budke, assistant killed in plane crash". Tulsa World. Retrieved 18 November 2011. ^ Niles, Russ (20 November 2011). "OSU Plane Hit Nose-First, Weather Not A Factor". AVWeb. Retrieved 21 November 2011. Andrade, John (1982). Militair 1982. London: Aviation Press Limited. ISBN 0907898017. Wikimedia Commons has media related to Piper PA-28 Cherokee.